Experience Tours is a premium Tour and Travels company that have all types’ tourist vehicles and cars like Toyota Innova, Tata Indica, Swift Dzire, Tempo Traveller, Volvo bus etc. for local and outstation trips. We understand the value of our clients because they trust us and we provide them best tourist vehicle for family trips. 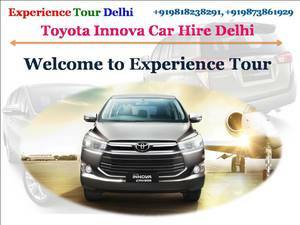 We offer you Toyota Innova car Hire service according your recommendation and surely it will be best for you. You can visit any adventure, heritage or religious destinations of India to book our service and make your trip more memorable and enjoyable.